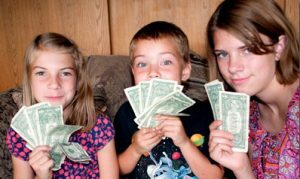 Can kids make money? In fact, should they be making money? Shouldn’t they go to school and get an education first? Well, times have changed. Kids themselves have started asking why they cannot have some side income, and take care of their own expenses. Many parents find it painful to accept this idea of kids being financially dependent. But there are quite a few who like this idea and do teach kids about money in fun ways. They believe that this will teach kids the value of money and work ethics. affiliate sales : This is when someone buys something after clicking on your link to that product. Ads : You rent out space in your blog to advertisers, and they pay you. Sponsors: People pay you to advertise their business. Sponsored posts: You write an article about a product or service. It is your opinion, but they will pay for it. When children work for money, they will realize that ‘money does not grow on trees’. Learning the value of money is important, but at the same time, just because they earn money, they should not have the license to buy or do anything they want. That is why along with starting to earn money, starting to save money is also important. Therefore, the number one money lesson is a saving lesson. A piggy bank concept is as old as the concept of money itself. The beauty of a piggy bank is that the child can see with his own eyes how money accumulates over time. How the little pennies add up to a big sum. A typical kid earns little on a weekly basis perhaps, but once he knows that his savings in the piggy bank grows on a weekly basis, at the end of a year perhaps, he will be able to buy a truly desirable and expensive item he wanted all along. So, what parents can tell a kid is that ‘now you cannot buy, but if you save your money, later on you can’. Children like to think of their future as bright and rosy. Very often it involves studying in foreign universities and going on a trip around the world. Such ambitions are to be encouraged. And at the same time, they can be told that in order to realize such ambitions, financial planning has to start now. Often it spurs youngsters on to think that they are saving for their own future. If saving up money is entirely about oneself and one’s own needs, a very unhappy and unfulfilled life may result. The secret of happiness is in giving. Children should be taught early on that sharing one’s resources with others is something that is expected of them. This can be taught in little and big ways: buying grandmother a present with the one’s own hard-earned money should be a really memorable experience for a teenager. Giving lunch money to a friend who is not so financially fortunate will teach him that money is valuable when it is used in need. Financial wisdom is something that should be taught to youngsters very early. Their adult selves will thank you for it.